How do sponges influence the availability of nutrients on coral reefs? The results of this work demonstrate that sponges do in fact alter the availability of organic nutrients in seawater. More specifically, we found that as sponges pump seawater through their bodies, they release a higher concentration of some compounds (such as some amino acids) and a lower concentration of other compounds (including some vitamins) compared to the concentrations in the surrounding seawater. This exchange of dissolved nutrients represents a previously unknown connection between sponges and the rest of the coral reef community, and our results have prompted further investigations to better understand the role that sponges play in a healthy coral reef ecosystem. Sponges are nature's filtration systems; they can filter up to 50,000 times their own volume in a day. Changes to coral ecosystems from climate change make reef sponges increasingly important. This project takes one of the first steps to explore the impact of sponges on nutrient availability on coral reefs. Contributions are tax deductible, and backers will get timely labnote field updates. We invite you to ask questions and connect with us directly in the comments - we'd love to hear from you! Do HMA and LMA sponges influence the water chemistry differently? How might this influence nutrient availability on the reef if sponges increase or decrease in abundance? We will be working with a colleague at the Smithsonian Marine Station in Florida, which lowers the cost of sampling significantly. We only need to cover the cost of sample analysis using two mass spectrometers in our laboratory. Sample analysis begins by extracting organic matter in the laboratory. Next the extracts will be analyzed on our two mass spectrometers to characterize the dissolved organic matter. One mass spectrometer will measure all compounds in a large mass range: 100 - 1000 Daltons, which includes most of the 'small' compounds that are important nutrients for many organisms. This is the "untargeted" method of organic matter characterization. The second mass spectrometer allows us to identify and quantify known compounds. We call this the "targeted" method of organic matter characterization. These complementary methods will provide novel information on coral reef nutrient dynamics that will be useful to scientists as well as managers and conservation groups. Cara Fiore has worked on diverse research projects from invertebrate ecology to medical biology. Cara received a B.S. in biology from SUNY Cortland, and graduated from the College of Charleston (Grice Marine Lab) and the University of New Hampshire before starting a postdoc at WHOI. Cara spent 10 days underwater in the Aquarius Habitat during her graduate work - see the press & media section. 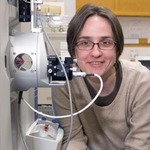 Elizabeth Kujawinski is an associate scientist with tenure in marine chemistry at WHOI. Her research interests reside at the intersection of environmental chemistry and microbial ecology and she uses advanced analytical chemistry tools to answer questions about microbe-chemical interactions in aquatic systems. She received her PhD from the MIT/WHOI Joint Program in Oceanography and completed postdoctoral research at The Ohio State University. She has been at WHOI since 2004. 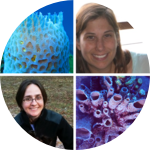 Dr. Cara Fiore has worked on diverse research projects from invertebrate ecology to medical biology. Cara received a B.S. in biology from SUNY Cortland, and graduated from the College of Charleston (Grice Marine Lab) and the University of New Hampshire before starting a postdoc at WHOI. Cara spent 10 days underwater in the Aquarius Habitat during her graduate work! Dr. Elizabeth Kujawinski is an associate scientist with tenure in marine chemistry at WHOI. Her research interests reside at the intersection of environmental chemistry and microbial ecology and she uses advanced analytical chemistry tools to answer questions about microbe-chemical interactions in aquatic systems. She received her PhD from the MIT/WHOI Joint Program in Oceanography and completed postdoctoral research at The Ohio State University. She has been at WHOI since 2004. Cara conducted research on sponges and corals while living underwater for 10 days in the Aquarius habitat in the Florida Keys. Click here to learn more.